Whenever the Harrington duo finds themselves heading out in any direction which may provide a micro-brewery pit stop, you can be sure the couple will stop in for a sampler at the least. (Two years in the land of watered-down-$&! @-beer will do that do a being). Anyway, en route to a family weekend in Cheyenne, the couple, plus sister Katie, opted to stop in at one of Cheyenne's breweries to sample the fare and get a taste for what the state of Wyoming currently has on tap. 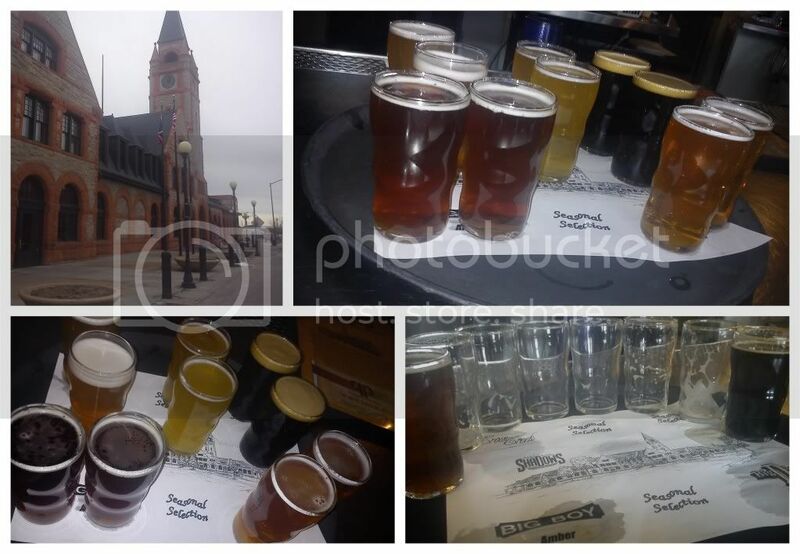 Shadow's Pub and Grill of Cheyenne, Wyoming has been a host to a micro-brewery, a non-host and again a host. The Pub and Grill, which is housed in the old Train Depot, was also host to various guests of the Harrington Wedding Reception seeing as how the couple enjoyed their first dance as Man and Woman in the neighboring reception hall, also located at the Train Depot. Alas, the beer. Within the sampler, the Harringtons enjoyed sipping on: Big Boy Amber, Big D's Pale Ale, Crow Creek Ale, possible Boxcar Stout (or another Stout) and another which currently cannot be remembered. True to form, Melissa was all about the dark beers and gladly waited for the other two sippers to take their taste and leave the rest for her to finish off. Both the Big Boy and Big D's sat well with the other two Harringtons and before long the sampler was finished and the trio was making their way to a youth basketball game and weekend filled with family fun and adventures!